Zika virus RNA has been detected in New World monkeys from the Northeast region of Brazil. This finding suggests that primates may serve as a reservoir host for the virus, as occurs in Africa. The results of numerous serological surveys have shown that different Old World monkeys in Africa and Asia, including Rhesus macaques, Grivets, Redtail monkeys, and others, have antibodies that react with Zika virus. In these areas Zika virus is probably transmitted among monkeys in what is called a sylvatic cycle. Periodic outbreaks (epizootics) of Zika virus infections in nonhuman primates have been documented. Where monkey reservoirs of Zika virus are present, humans may be infected with virus transmitted from a monkey. When non-human primates are absent, as on Yap Island, where an outbreak occurred in 2007, mosquitoes transmit the virus from human to human. The Zika virus outbreak in Brazil has been thought to have been mainly transmitted between humans by mosquitoes. However, the results of this new study suggests that nonhuman primates could also be involved. 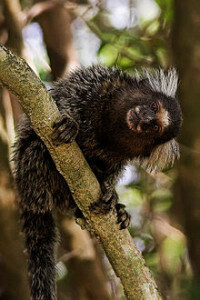 The authors used polymerase chain reaction (PCR) to detect Zika virus RNA in sera or oral swabs from 15 marmosets and 9 capuchin monkeys in Ceará State where the virus is currently circulating. Four marmosets and three capuchins tested positive for Zika virus in this test. Nucleotide sequence analysis of the PCR products from one marmoset and one capuchin monkey showed 100% identity with the strain of Zika virus that is circulating in Brazil. The sampled animals were obtained from distant regions of the State. The marmosets were all free-ranging but had contact with humans, while 8 capuchins were pets and one was kept in a screening center for wild animals. If these findings are confirmed and extended to other parts of Brazil, they would suggest that Zika virus might be spreading through non-human primates in that country. If so, they could serve as a reservoir for infection of humans via mosquito vectors. An interesting question is when Zika virus entered monkeys in Brazil. It has been suggested that the virus entered Brazil in 2013 or 2014, and might have spread first in monkeys, first in humans, or both at the same time. I also wonder whether monkey to human transmission leads to a different disease than when virus circulates among humans. Because Zika, dengue and chikungunya viruses are transmitted by mosquitoes mostly active during daytime, it’s important that all travelers visiting affected areas continue to take protective measures to prevent mosquito bites throughout the day. Discovery service could be sort of helpful.